I really like these sheets. Have held up better than my *** ones! Bring easy luxury and comfort into your bedroom decor with this rich and stylish duvet cover set. The thick and heavy, cotton-poly blend fabric features a 1000 thread count with a sateen weave the adds a soft feel and a lustrous sheen to the machine washable duvet cover and shams. The duvet cover is wrinkle resistant, and uses a button closure to keep your insert in place. This Duvet pure quality, but with the 1000 thread count it is so heavy, that it is hot without the down blanket. I thought it was going to be light and silky, but it just weights a ton. It is beautiful, but it does defeat the purpose of the down comforter with a climate control. Usually, we just throw it off during the night, because its just to hot. The duvet cover was delivered and I was so excited! Right out of the packaging it felt as soft and smooth as I had in mind. It is difficult for me to order online - I don't get to touch it, feel the weight of it - is the color right? This product was exactly what I was looking for and this was my first purchase from Overstock. The weight is great - we have cold winters and we like to have the window open at night. After the first washing the duvet cover was even softer - I have had no problems with pilling - which I did worry about after reading the other reviews. We we ordered the White duvet cover and have this on a dark gray quilt. I did have to cut a couple threads off but that is no big deal - seems like I have to do that every once in awhile on various clothing items I've purchased throughout the year. I redid our bedroom for my husband's Valentines Day present - we are both very happy with our purchase - it reminds us of a great resort vacation we took a couple years ago, with the beautiful bed linens, both heavy and soft - a luxury we now see everyday!!! Thank you Overstock for such a great price, quick delivery and quality product! I have been searching high and low for a duvet set in the right shade of purple and this one proved to be a winner! The Plum color is exactly what I hoped it would be. It's dark yet rich. It's big, heavy, and completely swallowed up my down alternative comforter which I think is more for warm weather and kind of flat. I had a hard time finding another one to fill up the space as this set is 90x92. Finally, I did an internet search on 90x92 inch down alternative comforters and found one that was 90x90 at Wayfair. I figured it was probably as close as I was going to get plus the reviews were positive so I hit the order button. When it arrived I got a little worried as I started stuffing the comforter into the duvet but it worked out wonderfully! I'm using it in a guest bedroom but I just had to crawl under all that plushness to test it out. My husband and I love it so much I'm ordering one for our bed. Great purchase! I'm glad that I washed this once before writing a review. I had initially been a little disappointed with the texture because I am now used to all cotton and this duvet was a blend. But once washed it now has that very nice cotton-y feel that rivals my duvets that are all cotton. A good buy. This duvet cover doesnt even cover 1 inch over the sides of the mattress. I have never been more disappointed in a product but obviously can't return it after washing..It shrunk up so much I double it would even hang 3 inches from the top of a queen size mattress. Don't waste your money like I did. This duvet set is well made of heavy material and feels very soft. The only downside is that there are no ties in the corners of the duvet cover to hold the comforter in place. Otherwise, I am pleased with the quality. I love this duvet cover set. It is so soft, stylish and abosutely perfect. Love the color, too. Love this duvet cover. It is heavy as the other reviewers indicated. I'm currently using it with an all-seasons comforter and it keeps my fiance and me quite toasty. The button closure can be a bit of a pain but it's not too much of a bother. I do wish it had buttons on the corners to keep the comforter in place- I will be sewing some in myself. It made a little noise when I first used it but is fine now. I ordered the ivory- it's a little more yellow/pink than expected but still nice. After washing, definitely take this out and either fold or use to avoid wrinkles. Overall, good value with minor flaws. Beautiful duvet set. Color is rich, fabric is luxurious. Extremely pleased with this purchase. The fabric is thinner than I expected., but they are very soft. The gold color is very nice too. They came out of the drier with very few wrinkles. Be sure to dry them on low heat as directed. I dried them on high without checking the tag and noticed several loose threads. 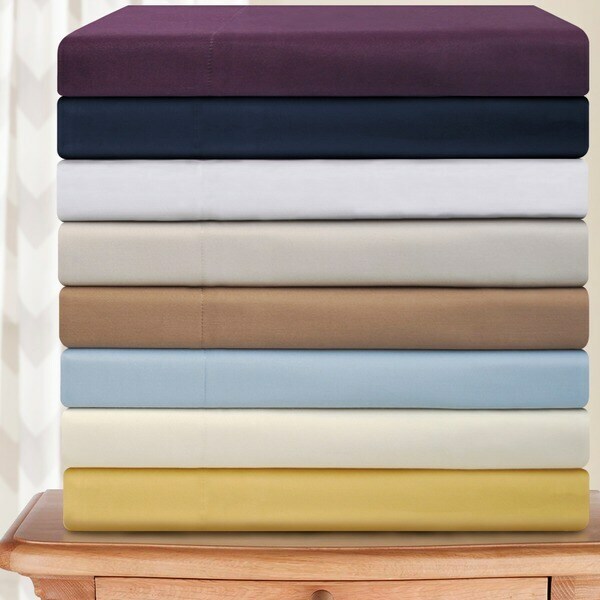 I read online that high thread count sheets have thinner threads, so drying them on high heat can cause damage. I will use a low heat next time. color is not at all what's shown on the website. This is the 2nd duvet cover I've ordered and had to return because of that. I realize that photos are difficult, but wish there was a better option. getting a bit frustrated. Quality of the items are fine, just not true colors. Love the quality, color (stone), and feel against the skin. Bought this for my son and it's not only durable but so soft! He loves it!! This duvet cover is soft with high quality stitching and material. I also purchased this as a gift since I enjoyed this product so much. Love this duvet cover. It is soft to the touch and elegant fabric. It has been very durable as it still looks new after several washes. It shows no spots so it must have a fabric protector. The weight is perfect, not too thin or too heavy. The perfect duvet cover. I needed something that was light but yet gave a pop of color to my bedroom. This is just right. This is made really well and I love the button closures. The picture shown is right on. I highly suggest to looking into these duvets if you are shopping. I love mine. I got the golden yellow color. Everyone comments on how pretty it is. The material is thick but smooth and washes very well. The cover is very heavy and could be used as a bedspread on its own. Great, soft hold up well wash great ! "Does this duvet have seams on the top side?" "I know someone asked this, but I just want to confirm that the ivory color is an off-white color that is bright and NOT dark and yellowy." It is a subtle off white tone (as is shown in the image carousel). "Is the ivory more of an off-white or more yellow tone?" Hi Annah, it is more off white definitely. I really love it . Nice quality , washes well and blends in perfectly with my pugs fur . Hope this helps . "does this duvet have ties in the corners?" Hello smama, this does not have corner ties. Thanks for shopping with us! "What tone is the gold color? Mustard, yellow, brownish gold? Thank you very much"
Hello twiggy748, in my opinion it is a bit of a mustard color but with a bit of a brownish tone. We hope this helps. Thank you for shopping with us. "i am in the UK is a California king the same as the UK Superking That is 6 Feet wide"
Hello Ellen, that is correct. A California King is 72 inches x 84 inches. Thank you for shopping with us. I have read all the reviews and they all seemed to be positive. I will see when I received the product. Hope it exceeds my expectations! Because I need and I like your sales deal.